Attention History Buffs! For the first time in over 10 years, The Kalmar Nyckel will offer public sails departing from Historic New Castle. Sailing enthusiasts, history buffs, and those looking for a new way to experience the Delaware River will have the chance to board the Kalmar Nyckel from a new port on 10 separate sails this Summer. The addition of Historic New Castle to the ship’s sail schedule keeps her in the first state for the entire Summer season, rotating between the Kalmar Nyckel Shipyard in Wilmington, The Cape May-Lewes Ferry Terminal in Lewes, and now Battery Park’s newly opened public dock in New Castle, Delaware. She will make her first trip to Historic New Castle August 19th and 20th for four total sails, and return for six more over Labor Day weekend. 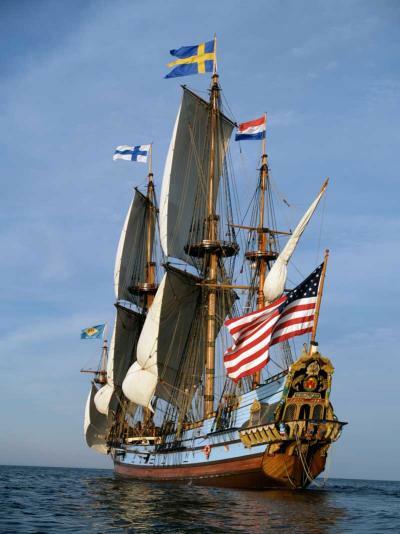 Kalmar Nyckel is a faithful re-creation of the Dutch-built armed merchant ship that brought Swedish settlers to North America in the 1600’s, establishing what would later become modern-day Wilmington. Captained by Peter Minuit, best known for his purchase of Manhattan island from the Native Americans. In addition to guided tours of the ship, passengers of “day sails” are afforded the option to work alongside the crew, hauling lines and raising sails, as well as simply enjoy the views. Kalmar Nyckel is available for charter cruises for private outings such as corporate events and team building exercises. Charter events have a maximum of 49 passengers. For tickets and more information about specific times and events, visit www.kalmarnyckel.org or contact the Kalmar Nyckel Foundation office at (302) 429-7447. Online tickets can be purchased by visiting www.kalmarnyckel.org/BookASail.asp. Historic New Castle sails are two-and-a-half hours in duration, and cost $60 for adults and $40 for children.